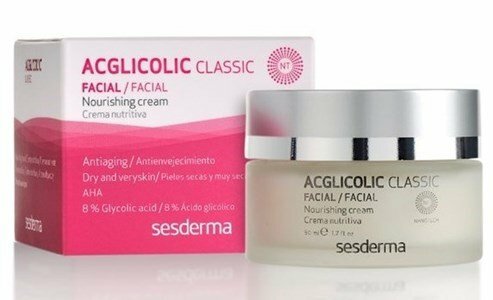 Acglicolic classic is a highly nutritious night cream with anti-aging action. Restores the functional balance of the skin, enhance the synthesis of collagen and elastin, protecting against aggressive external agents. Contains actives (hyaluronic acid, vegetal polysaccharides, jojoba oil), that form a film. Removes dead cells of the stratum corneum of the skin, reducing its thickness and smoothing the surface of the skin. Ideal care for dry skin. Apply the cream on the skin of the face, preferably at night, with a gentle massage until completely absorbed. Suitable for dry to very dry skin. First line of anti-aging products with lipossoma glycolic acid. Pioneers in the use of lipossoma glycolic acid in anti-aging treatments, Sesderma laboratories have created a complete line - Acglicolic - for renewal and moisturizing the skin. Stimulates collagen synthesis refirming and smoothing wrinkles and expression lines.